Directions: Follow the Google Maps directions which will lead you to a free, public parking lot. Once parked simply walk out onto the dock and you can head right up to the lighthouse. The Roanoke Lighthouse is a decommissioned screw-pile lighthouse. A very unique style, looking more like a cottage than a typical pillar-style lighthouse. The coastal dock and walk-up dock provide a number of vantage points, but in my opinion a dead-on shot is the most dramatic. 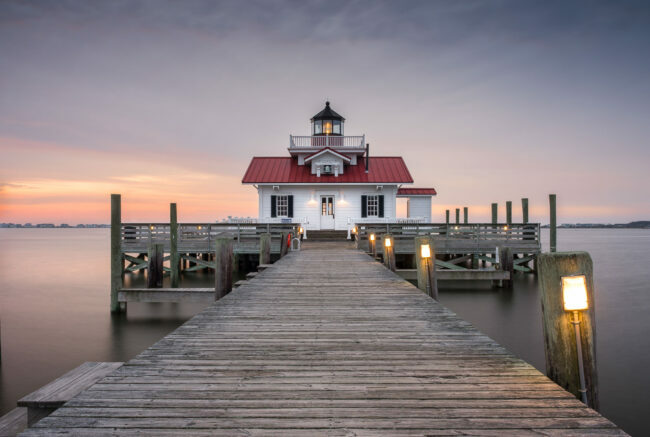 Be sure to spend some time before or after in the nice little town of Manteo, which is walkable from the parking lot. The lighthouse is west-facing, which means it will be silhouetted on a sunrise shot, and illuminated by a sunset shot. This shot was taken during sunrise so a bit of dodging was done to even the exposure. I’d recommend a stormy sunset for a promising first time shooting this location. Be sure to get there early so you can setup dead-center before someone else. A dead-center shot can only accommodate one photographer so if someone is already setup then take some angled shots from the coastal dock.